We are hosting our first event with a panel of 5 fab bloggers who will be sharing their own experiences via a little Q & A with the audience. The event is free and open to anyone who is looking to learn about creative blogging, support for starting or maintaining a creative blog to compliment their company and overall inspiration for connecting to this amazing community. 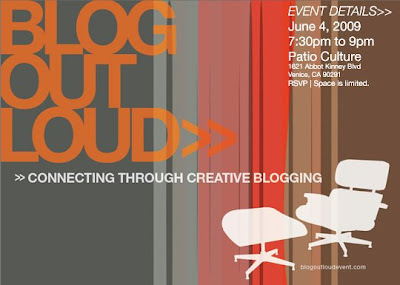 The 1st Blog Out Loud event is Thursday, June 4th from 7:30pm - 9pm at the very lovely Patio Culture on Abbott Kinney in Venice, CA. Click here to learn more about the event and here to learn about the panel. For more info, email lovinglivingsmall@yahoo.com.